Corporations that right size the growth opportunity and invest appropriately when it comes to their Hispanic customers increase their shareholder value and have continued success in the marketplace. The top experts, who contributed to this book, demonstrate how to do it right. WIN! 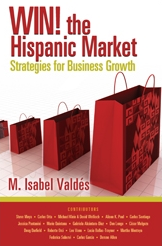 the Hispanic Market: Strategies for Business Growth by M. Isabel Valdés, a pioneer in the In-Culture© marketing and strategy, taps into the expertise of more than a dozen contributors, from Wall Street executives to advertising and retail experts.